The Texas bluebonnet is the undisputed star of the wildflower show that is on display every spring all across Texas (when moisture is adequate). Another beautiful native flower, the Indian paintbrush, has earned a costarring role. In fact, the two are often seen growing together. 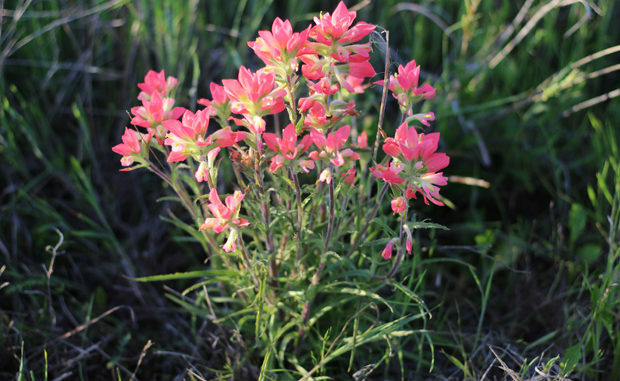 Indian paintbrush also is known by other names like Texas paintbrush, Scarlet paintbrush, Grandmother’s hair, Common red paintbrush, Butterfly weed, Prairie fire, Painted cup, and Painted lady. Most folks prefer to call it by its most popular name — Indian paintbrush. The name of this flower is based on the legend of an Indian who wanted to paint a sunset. Frustrated that he could not produce any of the colors that matched the beauty of a sunset, he asked the Great Spirit for help.